The big game starts this Sunday, you know, the one that more than 111 million people watched last year! Besides stocking up on soda and chips, you may also want to look at your options for actually watching the game (or the commercials, or halftime show – you do you). Did you know that more and more people are cutting the cord? USA Today recently reported that almost 19 million households will have ditched traditional cable by 2021 and another 19 million will have never had traditional cable to begin with. That’s almost 40 million streamers! Of course, streaming the Super Bowl isn’t just for cord cutters. Many traditional TV subscribers should have access to streaming apps and services. So whether your streaming in your living room, partying on the beach, or cheering from 36,000 feet, there’s probably an option for you. When Does Super Bowl LII Start? Super Bowl LII (52) is this Sunday (2/4) at 3:00 p.m. PT. Kick off is scheduled for 3:30. This year’s national anthem performance will be given by P!nk, so tune in shortly before the game if you want to watch. The Philadelphia Eagles will be playing the New England Patriots at U.S. Bank Stadium in Minneapolis, Minnesota. This is Minneapolis’ second Super Bowl, the first was in 1992 and saw the Washington Redskins defeat the Buffalo Bills by 37-24. This is expected to be an exciting game, as the Patriots have won five Super Bowls. If the Eagles win, this will be their first Super Bowl win. For some Americans, halftime (and sometime commercials) is the real reason for tuning in. Justin Timberlake will be performing for the third time. It’s be fourteen years since his 2004 performance with Janet Jackson that helped make delayed live TV popular (about 5-10 seconds usually). Which team is @jtimberlake rooting for in #SBLII? First off, lets start with the great news! Anyone can watch this year’s Super Bowl for free on their Mac or Windows PC by visiting NBC.com, NBCSports.com, or using the NBC app available on Apple TV, iOS and more. (If you live off the grid you could always try an antenna and a prayer). Additionally, you’ll get more than just the game. NBC live streaming will be available from 9:00 a.m. PT to 8:00 p.m. PT. This means viewers will get 11 full hours of streaming that will include pregame festivities, and the latest episode of hit TV drama This Is Us (BYOT – bring your own tissues). The NFL, NFL Fantasy, and Watch NFL Network apps on iPhone will offer free streaming. Additionally you may be able to stream the game using NFL’s website, depending on your location. You can never have enough free options (what if one of the other options stops working? ), the Yahoo Sports app will offer free streaming on iPhone. fuboTV is all about sports. So yes, it will have the Super Bowl. If you’re a sports fan and are looking for a reason to give fuboTV a try, now would be it. You’ll get 70+ channels with live sports free for seven days, and your first month for $19.99 ($44.99 per month after). Check with fuboTV to see if NBC is offered in your area. Learn more at fubo.tv. Hulu is quickly becoming one of the best options for streaming live TV. They’ve added a lot of content, have promised to fix their UI (and even add a guide), and will even be offering a more personalized experience for this year’s Winter Olympic Games. Hulu does offer a DVR option so you can record the game to “My Stuff.” However, if you pay for a no commercials plan, you may still need to watch recorded ads as not all shows support this feature. While DirectTV NOW doesn’t offer a DVR feature (yet), it does offer the most live content. The standard plan ($35 per month) will include NBC if it’s available in your area. Sling TV is easily one of the cheapest cord-cutting options. It’s $25 Blue plan includes NBC (in select areas), but you may also want to add the $20 Orange plan if you want more channels (like Disney, Freeform, and TBS). While being (fashionably) late to the party. YouTube TV offers one $35 package with lots of great channels and local content. Additionally, YouTube TV has arguably the best user interface and offers unlimited DVR storage. Keep in mind, YouTube TV isn’t currently available on Apple TV, but it’s coming soon. Will I Get to Watch the Commercials? While many people usually dislike ads, commercials are a big part of the Super Bowl. In fact, advertisers willing to pay millions of dollars for short—often funny or inspiring—TV ads. While you don’t have to wait for the game to watch some of the commercials, if you’re watching the game live you will definitely get to see them during the breaks. Can I Record It for Later? Maybe. Many live TV streaming services such as FuboTV, Hulu with Live TV, PS Vue, YouTube TV, and Sling offer DVR options. DirecTV NOW doesn’t currently offer DVR, but is planning on adding it. If you have a DVR feature with your plan you shouldn’t have any problem recording Sunday’s game. Depending on how your DVR feature works (e.g. with Hulu you just add the Super Bowl to “My Stuff”), you may want to specify time before and after the game to make sure you don’t miss anything. Why Is the Super Bowl Only on NBC? Fun fact: The rights to broadcast Super Bowl are shared between the three major networks, CBS, FOX, and NBC. It rotates every year and this year is NBC’s turn. With so many ways to watch Super Bowl Lii, there really isn’t a wrong way to do it. Honestly, just do what works best for you. Keep in mind, some apps will only let you stream on so many screens at a time, so you may want to utilize more than one option. Also, because so many people will be watching, it’s possible that some services may work better than others. You may want to choose a backup service to be sure you don’t miss any plays. 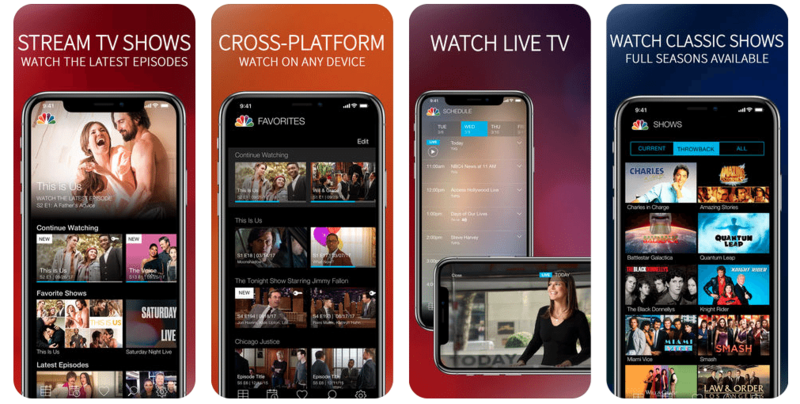 NBC’s app and website will likely be the best option because it’s free and straight from the source. However, if you want to record the game, you may want to choose a streaming service with DVR capabilities. No matter how you decide to watch, there are plenty of options and this is likely one game you won’t want to miss! A trick to get free traffic from YouTube and Facebook?